This is a simple technique for walking your Labrador on a loose leash. Everywhere you go, you will see dogs on leads. Some of those dogs are trotting happily along at their owner’s side. Others have a rather different style. You will see their owners, hurrying along with one arm stretched out in front a bit like superman (the resemblance ends there). The outstretched arm grips an outstretched lead, and at the end of it is a dog fighting for air. Front feet scrabbling at the pavement, this dog is intent on choking himself! He is completely oblivious to his owner, and completely focused on straining at the end of the lead. Sound familiar? One way to help resolve this unpleasant situation, is to teach your dog to walk on a loose leash. And that is what we are going to look at in this article. You may have heard of the ‘waiting for a loose lead’ technique, where you just stand still and refuse to move forwards while the lead is tight. This can take a very long time with a determined puller. So with our adaption of this method, we’re going to speed things up a bit with some food, and a few sneaky tricks! You’ll need a longish leash – six to eight feet is fine. Not one of those extending leads. 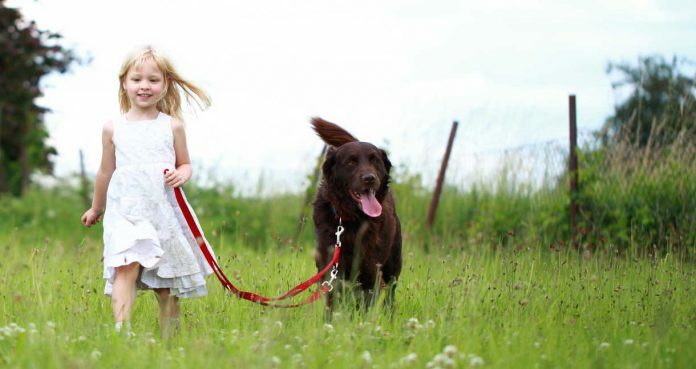 Make sure the leash is attached to a body harness or flat collar, not a slip lead or choke chain. You’ll need some food rewards in an easily accessible container – a wide mouthed treat bag or large pocket is ideal. This is a helpful aid in the training process. An event marker simply marks the moment in time when your dog did the thing you wanted him to do. It is a communication tool and it consists of a distinctive word or sound. I suggest you use the word ‘YES’ as your marker – if you are used to a clicker then by all means use it. [wp_ad_camp_2]Find an open space outdoors where you won’t be distracted. If you have to drive your dog to a deserted car park or quiet street so be it. You won’t get anywhere if there are distractions to begin with. A hard surface (tarmac or paved is ideal) is helpful as it enables the dog to quickly find and pick up the treats. Set aside at least ten minutes for this training and do it at least twice a day. Three or four times a day is even better. Step 3: Wait Now wait for the dog to give you some attention. At some point your dog will get bored with straining at the end of his leash and turn to see what is causing the hold up (see below for what to do if this doesn’t happen). 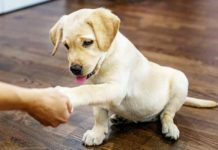 Step 4: Turn As soon as you have your dog’s attention, turn around and face the direction you have just come from, look over your shoulder and encourage your dog to come to your side, drop a treat just behind you for him to collect as he reaches you. Start walking forwards (Step 1 again) as soon as he has gathered his treat from the ground. The dog will probably then charge past you to the end of the leash. You know what to do. STOP walking. Make like a tree. Pause, gather your thoughts. Rinse and repeat the steps from 1 through 4. What if the dog won’t turn and look at me? After waiting a moment, it is OK to attract the dog’s attention. Make a little kissy noise with your mouth for example. As soon as he looks at you drop a little food on the ground then turn away from him. The idea is that when he eats the food he will be in the right position just behind you, and that this position will become attractive to him. What if my dog won’t come towards me? If your dog won’t come towards you to collect the food you dropped on the ground behind you, think about how you are motivating your dog. Your rewards may need to be upgraded to something more attractive and smelly. The first few sessions will be a bit boring. There will be waiting, and hanging about. Hang on in there, you need to be determined. Just focus on the fact that you have simply had enough of letting your dog drag you around. It may take three or four sessions before the dog figures out there is no point in charging past you, starts to pay you more attention, and watch where you are walking. At this point, you’ll find you can begin to walk further in each direction. You haven’t won yet, your dog may still rush ahead from time to time. He’ll just wait until you’ve gone a few more steps before zooming to the end of the lead. But these occasions will become fewer and further between. And you will be able to walk longer distances and get to where you want to go, without stopping and changing direction every two seconds. All you have to do is stand firm when your dog gets it wrong, and reward him when he gets it right. You can do this. It takes a little patience, but you can do it. Just like any other skill you teach your dog, you need to start in a distraction free area. But there comes a point, when the dog has really grasped what you are teaching him, when you need to introduce some distractions into your training. Dogs eventually have to learn to walk past other dogs, people and the neighbourhood cat, without charging about like lunatics. Don’t expect this to happen by accident. You’ll need to teach your dog to walk past things he finds exciting, without breaking the new loose leash rules. This is called ‘proofing’. 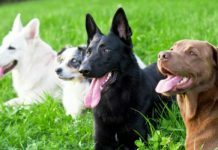 It helps to start with any distractions at a distance and to set up training exercises where it is easy for the dog to win because you have some control over the other participants. You can do this with friends or at a training club. At the end of each session, I suggest you make a note of how you got on. It’s easy to forget just how far you have come when you are training, especially at times when progress is slow. And after a few days, you’ll find it helpful to see how much progress you are making. As your dog gets better at walking on a loose lead, it becomes tempting to forget the rewards altogether. [wp_ad_camp_1]This is a sure way to see your efforts undone. Always carry a few treats on you when you are out with your dog. Reward him from time to time when he is being good. He deserves it. Just remember to feed him ‘at your heel’ either by dropping the food just behind you, or giving it to him from your hand. This is a simple exercise designed to help people who are struggling with a dog that pulls them around on a lead. It will only work if you stop ‘rewarding’ your dog for pulling. 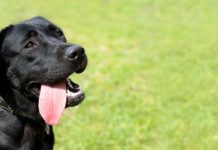 During the time period that you are teaching this new skill to your dog, it is better if you don’t ever allow your dog to move forwards while his lead is taut. This is because every forward movement your dog makes on the end of a tight leash is a reward for him an reinforces the pulling behaviour. 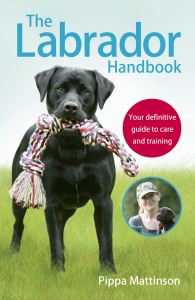 Find out more about getting a well behaved Labrador in our Training section of the website. Next articleYour Labrador’s Magic Word! I tried your loose lease training tonight with my 7 month lab and I can honestly say for first time I actually enjoyed the walk. She did exactly what you said she would and tomorrow morning I am very excited to repeat. We have a 1 year old Labradoodle and is a nightmare to walk she pulls constantly and is worse when she see people or other dogs. I have tried giving her a treat when is by my side walking nicely, stop and start, turn and walk in the other direction but I feel stupid as I am walking down the road turning constantly. I have a halti on her and she walks lovely but don’t want to walk her on a halti the rest of her life. Forgot to ask…my lab is 11 weeks, not hooked up a lead yet, he remains close when we walk in a park near our house. Should I be training click to heal first or loose leash first to get him used the the lead without pulling? So much to digest! Hi, can you tell me at what point you should apply the clicker in this technique? Also, once the dog begins walking at a heel at a few paces, when do you introduce the que, “heel”? 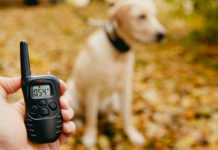 Just wondering when would be the correct time to use the clicker when practising the loose leash technique? Would it be when you change direction and encourage the dog but before you throw the treat? So far my 3 year old lab is doing pretty well at not pulling me as much. The big issue I have is that he over-powers me when he wants to. I live in an apartment and many of his walks are around the complex. This makes it difficult to only walk without distractions. He also chases cars. Since there are no walkways around my complex I am constantly in fear of when a car will drive by. He has almost gotten us both hit several times. I have tried everything I can think of to break him of this habit. I was advised first to try a shock collar and then advised not to try it because he was rescued and has some anxiety. This is really not the way I want to train him anyway. But I don’t want him to injure himself or worse. Every walk is extremely stressful, especially when there are slippery conditions. We practice on every walk we do but it all goes out the window if he sees a car. The trainers I have seen and the research I have done all pertain to people who aren’t forced to face these distractions multiple times a day. How do I make things more enjoyable? My dog is a Labrador/springer cross she is 4 years old. She has alway pulled on the lead despite trying different leads and collars. For the last 6 six weeks I have been trying to train by continually changing direction and telling her to heel. The lead is pulled tight and under strain all the time. She is still horrendous at pulling until the last couple of minutes on the way home then she is perfect. If I reward her she seems to think oh I’ve been good I don’t need to do it anymore. She is so strong, next stop is a halti! Hi I am so glad I am not the only one having trouble walking my dogs. We have two labradoodles, we try to walk them together big mistake what a site to get seen, and we are all unhappy. We are so frustrated having two medium size dogs to teach, too hard. But what can we do, press on trying to teach them separately. We need help, I don’t want unruly dogs. I have a problem with my 9 years old Labrador. My parents doesn’t give him a lot of exercises so he is always really excited before walks. I usually play with him in the backyard and let him run so he can be calmer before going for a walk. I have been trying to teach him how to walk on loose leash for quite some times. Even tho he has made a lot of progress he stills pulls a lot on the leash. As soon as he reaches the end of the leash I stop. He stops also but instead of turning his head or coming back he walks backward and if I don’t move he starts whinning. On the way to the park when he pulls I stop and I change direction, he follows me but he goes ahead of mealmost immediately if I change direction again he pulls even more because he knows the park is that way. I don’t really know what to do to make him stop doing that. I have a 7 month black lab, Emmy. She is amazing! She is perfect at sit, down, leave it and stay, even in high distractions. Our only problem is walking on a leash. I read this article and the one on heel and have a couple questions. 1) We’ve done the change-direction-when-pulls idea you describe and she does great inside, then in the yard, then in the neighborhood, but anywhere new, her nose is to the ground and nothing I have interests her at all. Any ideas? 2) I was considering trying “heel”, but I think I’ll run into the same nose-to-the-ground problem and I do want her to be able to explore, just not pull. Is heel correct to use here or is there a place for heel and a place for loose leash? Thanks so much! I do really enjoy your articles and they’ve been very helpful! 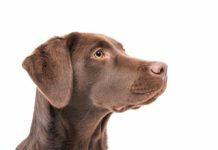 To teach your dog to keep her head up, you’ll need initially to motivate her with something she wants. If your treats are not working, you need a better reinforcer. Better food (messier, smellier, more interesting) or a favourite toy, or a hungrier dog. You’ll need to offer food with very short gaps in between (treat streaming) then space out the gaps between treats as she improves. It’s a question of getting the right behaviour established, one step at a time. Refuse to move forward until she lifts her head. Reinforce ‘head up’ generously to begin with. Hi. Is there a way to revert the direction without pulling the dog in a way that stresses its back legs? The thing is, my girlfriend’s dog has this condition on her back legs. Her joint bones don’t stop growing. She even takes a daily pill to reduce the pain, and from time to time has to undergo surgery. So the stress on the joints can be painful. Obviously, she doesn’t care, she pulls nonetheless. So far the alternative, not to stress her legs, was to run along her, letting her drag us. But obviously, by doing so, we’re rewarding her for pulling. To this day it’s very difficult to walk her on a leash. The solution is usually to put her in the car and release her in a park or somewhere else where she can be off leash. But even at these places there are situations when we have to put her on a leash, for example aggressive dogs around, toddlers she could easily knock over while playing, people afraid/allergic to dogs etc. To add to the problem, when a puppy this lab started training for being a rescue dog, and different trainers kind of screwed things up. When her condition was diagnosed, they’ve aborted the rescue dog training. I’d like to train her not to pull (I mean, I’d like to start, my gf will have to do most of the work anyways :)), but of course I don’t want to hurt the dog. Any special advice? It sounds as though training her not to pull is a priority for your girlfriend. She may have to invest some time into getting through the training programme as fast as possible. Has your vet given you any specific advice about positions or activities to be avoided? Hi Pippa. My 14 week old chocolate lab puppy has suddenly refused to walk on his lead; having loved it before, it’s now bottom down and won’t budge but dragging him seems cruel. No recent scares but even when I get him to the park, he just does his business and then mopes about. I have been sticking fairly closely to the “five minute for every month” rule on his organised walks, but have probably gone a little over as he is such a big unit and seemed to crave the exercise. He doesn’t appear stiff and his temperament at home is still lovely. Appetite healthy. Is this just a phase or should I be vet-bound? Many thanks in advance. I have taught my 6 month old rescue not to pull using the traditional method: each time he launched ahead I would turn sharply in the opposite direction and say ‘Ah Ah!’ quite harshly. It took two weeks of persistently doing this but now he does not pull. I used rewards (treats) to encourage him to stay close to me, in the heel position. However, he does keep creeping forward of my left leg. Each time I say ‘Ah Ah!’ he retreats back to my left leg. But I find I am saying ‘Ah Ah!’ every few steps! I sound like a broken record. I feel I have reached a sticking point – what can I do to break this habit please? You must have know that I was struggling… We went to one dog trainer who wanted to use a prong collar – we left! We went to another and they’ve been brilliant and my lab is amazing when in the class and we’ve learned so much and he’s so much better but we struggle with heel work when starting our walk but not when we’re returning. Having read the above article, I now know why! We’re going to go back to the beginning and start again using your links – wish us luck! Could you let me know if this is all in your Total Recall book too?